June has been a super busy month! Here is a short (ish!) summary of my racing: The race I look forward to most every season is without a doubt the Smithfield Nocturne. The atmosphere and standard of racing always make it an amazing evening to be a part of. And looking at the start sheet prior to the race on the night, I knew this would be the toughest Nocturne yet, making it all the more exciting! Having been called up to the start line first, I had a long wait whilst the rest of the field were presented. As I stood there my nerves built up, the five deep crowds hardly proving a distraction, with thought of trying to defend my Nocturne title against such strong competition weighing heavy on my mind. Amongst the field, households names from the Olympics such as Laura Trott and Dani King, started to line up alongside me. In the end, it all went, nearly, to plan. Despite racing against eight strong Wiggle-Honda women, I managed to take the sprint in what proved to be a super close finish. It was absolutely amazing to take my fifth straight win in central London! Three days later I found myself lining up for another crit, this time in Woking for round four of the Johnsons Healthtech Tour Series. I felt confident going into the race of the back of Smithfield however two new faces from France and the US ensured I still felt very nervous lining up for the start. However everything seemed to fall away from the start, my nerves – as I attacked straight from the gun and then not long later my front wheel, sending me chin first toward the tarmac. It never entered my mind to pull out, simply to get straight back into the race and try to pull off the win for my MG-Maxifuel team. With the adrenaline rushing I managed to do so, taking my third win of the series in yet another sprint finish! Soon after the podium the pain hit me and it was off on trip to the local Hospital for nine stitches in my chin and lots of mummifying bandages, I must say a huge thanks to all the amazing staff at Woking Community Hospital! After a few days of recuperation and some attempt to take in the frankly overwhelming amount of support I received from the crash, I was back on the bike. I knew I had to simply finish the last round of the series in Ayelsham to take the overall win, something I really wanted to do say thank everyone for all their support. However my main target was to simply not crash, a task made all the harder by the torrential rain on what proved to be a slippy and tight circuit. In the end the night proved a successful one for our team, taking the Individual, Sprint and Team competitions for 2013, with some Fish and Chips to celebrate our successful Tour Series campaign! However, as is always the way, there was little time to mull on the success of the Tour Series. Barely a week later I found myself on the long drive up to Glasgow for the British national TT and road race championships. The week didn’t go exactly as I had planned and I came away pretty disappointed with my performances. After my success earlier on in the season, I had hoped to do better, however you live and learn and I definitely took some good lessons away from the National Championships. The Curlew Cup a week later proved the perfect opportunity to turn around my disappointment from the racing in Glasgow. After the nationals I had a few days off before returning back up to the north and the Women’s National Series in Newcastle. It was a great event, held alongside a men’s Premier Calendar race, with good support and a brilliant atmosphere. I managed to take the win from a breakaway that formed in the latter stages of the race, reversing the trend of my bunch sprint wins and capping off an enjoyable June! 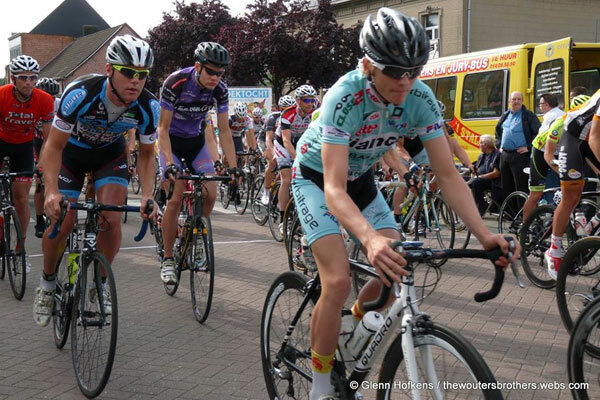 This entry was posted in Hannah 2013 Rider on 05/06/2014 by Gary Baldwin. It’s been a muddy month. Mum and the washing machine have been doing overtime to make sure my new santini kit is always clean. Were contemplating asking vanish for some sponsorship, we go through so much. To start the month off I went to Elveden estate in Suffolk and entered a women’s race. The race was a very wet and cold one which was a huge shame because it would have been a lovely race with some lovely scenery. I was pleased with how the race went and to get my first win for the team. The 12th march was the day of the MG Maxifuel team launch! It was going to be a jam packed day with a lot of standing around in the freezing cold for photos.I really enjoyed meeting all the sponsors that were on board for the year and all the team meeting up again after our training camp in Spain. The best part of the day though had to be the lunch buffet which was amazing! After getting my new Windy Milla Bog warrior mountain bike on the Thursday i entered a Gorrick which is a local mountain bike series just so I could get the feel for it in a racing environment. I really loved the bike and the way if handled. I could really feel a massive improvement from my last bike i owned. There is an article on bike radar that went out last week which gave the team and the bike a lot of exposure. The first round of the NPS was in Sherwood pines on the 24th March. I was really nervous about this race because I was going into the complete unknown. I had no idea how I would do and where I would come. After being grided right at the back of 30 riders I had my work cut out due to the course going straight into a section of single track. I managed to get a really good start and made it to 3rd wheel by the time we got to the second section of single track. The weather had been really bad the last couple of days which meant there was a couple of inches of snow on the course which made it very difficult to ride on. I had to really think about my tyre pressures so I had the right amount of grip for the adverse weather conditions. I was really pleased with 2nd place behind the South African who has been u23 world champion. I hope to keep my form for the next round in Cornwall and get another good result. I am looking into doing a few world cup rounds and to carry on mountain biking at this higher level. Good Friday was the first round of the women’s team series and we made our way to east London to the the Redbrige circuit or Hog Hill as it is known. The course is really hard with quite a considerable climb in it and after a lot of laps it gets harder and harder and always in the back of your mind is the finish is at the top of it. At the beginning of the race I always get a bit carried away and with the field being 90+ riders of all abilities I was keen to make it hard from the gun. This makes the race safer as the less able riders are spat out the back almost immediately. The plan was to make sure mg-maxifuel were always represented in all brakes that went away. With 2 laps to go the bunch slowed down considerably which meant that everyone was preparing for the finish. 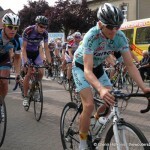 I was pleased it was coming down to a sprint and just needed to spend the last couple of laps recovering in th bunch. I made sure I had the inside line and made sure I left it as late as possible. I was really pleased to get the win and pleased that I have some early season form. After all the bad weather we had in January, I just wanted to get away, there were a group of guys looking for some good weather to train in, going to Majorca. They had a spare room in an apartment so I jumped at the chance and booked the flights straight away. We were pretty lucky, a lot of days were shorts and jersey weather which is very rare at this time of the year. Not knowing, when I booked it but while I was there, the Challenge Majorca races were taking place. This meant all the major world tour teams were there and occasionally, we would come across them while we were out on our bikes. I rode back to my hotel one afternoon with Van Summeran. After 10 days in Majorca it was time to go home, back to the snow and life on the turbo and my mountain bike. This was a lot more bearable knowing that I was jetting off to Spain in 2 weeks time. On the 16th Feb my sister , brother and I went to London to have a heart scan. I didn’t quite know what to expect from the scan and what the procedure was. Walking into the waiting room I was shocked and pleased with the number of people there. This has become an issue since Mwamba suffered a cardiac arrest on the football pitch. Oddly enough I think because it happened to such a fit healthy athlete people have taken the precaution and had the scan. We all passed with flying colours. The day we went to the hospital the BBC cameras were there. They were shooting a programme called “bang goes the theory” and they asked if Alice and I would feature in it. We were up for this as we had a good story to tell. We mentioned we were cyclists and the charity “CRY” (cardiac risk in the young) which is what happened to Alices friend Lewis Barry and I was able to mention that I was being sponsored by the Lewis Balyckyi fund. I hope they put us in and we don’t end up on the cutting room floor. This year I have made the bold move and decided to go back to my roots and do the mountain bike season as well as all the road and time trials. I have started doing a few local races and have been successful in them and I am pleased with how I have done. I can’t wait for the season to start and with the team supplying me with a mountain bike I am determined to do well. This month I have had a lot of sponsor’s events to go to. Santini issued the team kit and some of the bikes have SRAM group sets on. These are all part of Fishers that is a large distributor in U.K. They had a charity ride on Sunday 17th Feb that I had to quickly rush to from a mountain bike race in Surrey in the morning to Essex by 1am. Luckily enough the ride wasn’t very fast and we stopped off at a pub half way round which was good because I had seriously gone into the red during the mountain bike race. On Monday I went on a ride with Magnus Backstedt, not many people can say they went for a ride with a Paris Roubaix winner it was very special. In the evening there was an auction dinner and because MG-Maxifuel is being sponsored by Fishers they wanted a few of the riders to be present. It was a very good evening and I enjoyed getting to know all my sponsors personally. I was super excited about getting my new road bike hand made in Italy for Windy Milla and couldn’t wait to get out to Spain and ride it. Riding around Spain with all the team, on the same bikes and all wearing the same kit made me feel really proud and made me feel part of a very professional looking team. With Magnus being on the team he suggested we went to Benidorm because that is where he went with Liquigas and he said it was very good. The first few days the weather was good and we got some good training rides in. After being in Majorca a couple of weeks before I was hoping for some good form so was pleased when I was going up the climbs comfortably with the men and could see a noticeable improvement in my climbing. Unfortunately the weather wasn’t typical Spanish weather and took a turn for the worse after day 3. This hampered out plans and we had to train around the weather, which isn’t ideal. We still got some good training in, you just had to man up and deal with the rain and wind. As most training rides go a café stop half way round is a must. I am not a fan of coffee which no one could understand, a cyclist that doesn’t drink coffee…..crazy. I pretty much drank Benidorm out of Lemon Fanta, and always got a laugh when ordering one in my Spanish accent “Fanta Limon” the trip was really good and I enjoyed getting to know all my team mates and everyone is really looking forward to the racing season. It was typical that the day we travelled home the weather was the best it had been all week but that’s life and I was pleased to be going home confident with my form and getting stuck into racing. Hi everyone, this is my blog update for July’s riding roundup. This month ive raced 7 times so you could argue that it has been a fairly busy month in terms of lining up on the start line. 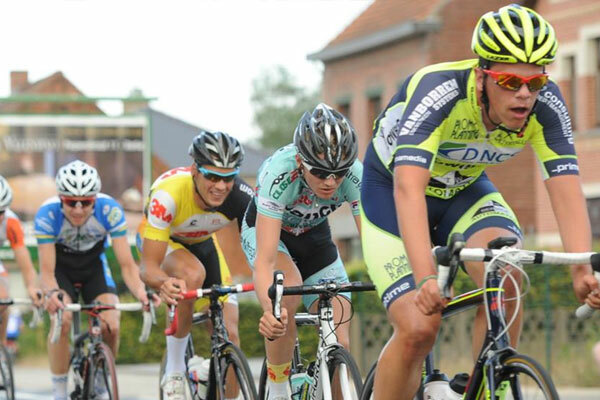 These racing ranged from local leagues for ‘points grabbing’ and national standard criteriums. We know as cyclists, the winter times are about getting long miles in on your trusty old steed. Although, sometimes your trusty old steed needs some TLC as the winter weather does its best to damage your pride & joy. Therefore I had to purchase some new wheels & tyres to see me through the training that I am doing. With the trust fund, I have been able to purchase these parts, so now ive got no excuses not to be out training! Also, as part of being a cyclist, you have to give your body the fuel it needs and after a lengthy training session, it needs its protein! As I had just ran out of my previous stuff, the trust fund was able to help me purchase some more recovery powder, now it means that I don’t get home after a ride and then suffer for the next few days as I didn’t get a good source of protein. As the racing season is just around the corner, I will have plenty more to write about as my calendar is pretty much full for most weekends, all I can say for now is watch this space! Also this month was the 1st crash that ive had in 2 whole seasons, I thought I was going soft and my luck was sure to run out soon. It was when I was racing in Middlesborough when a lad rolled his tub in front of me at 53km/h. Yes it hurt… but I got back on my bike, which was not damaged at all thank god, and manned it up and got round and picking up 10 points ( which haven’t been put on the system yet and im getting evermore annoyed about). 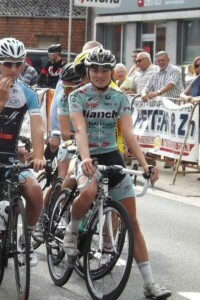 There was also the 3 national circuit series rounds in the month which I rode. You could say that I was the boy in a mens race as I will admit that I had my arse whooped. I had been getting dropped in the first 15 mins of the race when they at their hardest, I think this is party down to the specific training needed but more importantly the warm up. Been at this national series races are hard for people like myself as you can sometimes struggle to get a good warm in as you are generally ‘out of the way’. By this I mean you will be out of the pits area where the big teams get to warm up right next to the circuit and they have the space, with me and my rollers, it can become hard to find a good place to warm up as the crowds make it very hard. My favourite course of the three was definitely Sheffield as it has the right city centre environment for a good race and it also included some cobbles and a sketchy corner on a fast downhill section. Congrats to Marc Etches and the rest of the Sheffield GP organisation team for putting on such a good event and I hope it can be the same next year! There isn’t many races left for this year and I am desperate to get my hands in the air because not doing so can often knock the long term morale therefore I have now upped the training and getting in some big rides such as the classic ‘moss, Snake, Strines’ ride which is a 90 mile climbing epic which ventures into Derbyshire from Holmfirth and takes in great scenery. Its what makes cycling enjoyable in my opinion as you get to see great sights which can often be ignored if you live in built up areas. This entry was posted in Ashley 2012 Rider on 05/06/2014 by Gary Baldwin. This blog update is a summary of my racing and training that was done in June. This month consisted of me finally leaving 6th form, sitting my A level exams and racing some of the biggest races to date! My priorities for this month were obviously my a level exams as you cant do much in life without an education these days, hopefully my hard work and revision will pay off and I will achieve the grades which are needed for me to go to Chester university! My last exam which was also my most important one was the P.E exam which was on the 20th June. Anyone in the know will realise that the 20th June was also date for the National circuit champs, which I had also entered… It was a very stressful day for me, I went out for an hour in the morning before my exam but I was struggling to even just pedal as I had my exam in just a few hours. Thank god it went pretty well and now that was out of the way it was time to get my head in shape for the evenings race at Otley. It was good weather and luckily the rain held off for the national champs. I always knew the race was going to be extremely hard for me as I am only 18, and the majority of people who were riding have been riding the infamous tour series which had been broadcasted on national television. I got a good start to the race, surprisingly I managed to get myself into the top third of the bunch for the first 6 laps, which I may add were the fastest! But my lack of experience of racing at this elite level showed as I lost a bike length going over the climb up Burras lane. This bike length suddenly developed into 5 bike lengths and I started to slip back through the bunch. I lasted another 2 laps towards the back of the bunch but it is true what they say, it is much harder at the back of the peloton. I soon slipped into the point of no return and then I was spat out of the back. I was kicking myself afterwards because I knew deep down the bike length that I let slip, I could have made up if I was on the ball more. But at the end of the day, I accepted that it was the National crit champs and that for some riders, it will make their career to win this. Full credit to Scott Thwaites for winning the race though, he has been riding immensely all season and he is a great guy to chat to. A true champ who hopefully will move on to bigger and better things next season. The other big race of this month was the Brighouse crit which was the first round of the National circuit series. I was looking really forward to this race as it is local to me and it has been resurrected after 2 years of it not been run. It is a pretty simple course but it does have some tight bends in it which suits my style. I had it a fairly descent start but the race rocketed off in the first third which put me on the back foot after an improper warm up. I managed to ride myself into the race with other riders which formed a group. We managed to catch the main bunch back up, but the race was over as the front 6 which had broke away lapped the field! 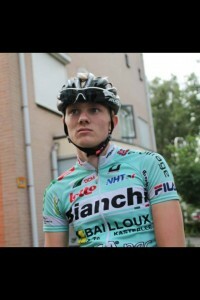 I was feeling good though all through the race and I finished my first elite crit and came about 35th. Hopefully the only way is up after this as I will be racing Colne & Sheffield in July. Keep tuned in for next months report! Hello again everyone, this blog is a summary of a relatively quiet month for me as there has been various race cancelations from my calendar. I only ended up getting about 3 races in May because by weekly circuit race league, Tockwith, was cancelled after 1 round due to various reasons which included something along the lines of a noise complaint!? Im not sure if this statement is correct, but if it is then I think that we need to invest in some quieter gears because they obvisously seem to be disturbing some people! Due to there been few races for me this month, it gave me some time to just ride my bike and let my body condition itself at a slower rate, I think this helps me in the long run as it doesn’t knock my immune system as much therefore I feel less ropey and ill. I raced up in the North East in a E/1/2 at Prissik park. The cycling development team up there are putting on a lot of circuit races in the region and they are a credit to themselves as the events they are organising are top class and they deserve to be more well known. They were some good riders that turned up including what seemed to be half a field worth of Velo 29 riders which made it a complex race for lone riders like myself. I tried my luck a few times but came to nothing, but in races like these, you have to try and get in every move as you never know which one is likely to stay away. Unfortunately, I missed the winning one which consisted of some really strong riders. It was annoying that every time you tried to bridge across to the break, there was a Velo 29 rider hot on your heels, but that’s bike racing! Another race which was on at the end of the month was the Batley RR, this is probably my most local race which was around the Hartshead moor. Most of you might know it as the service station on the M62! It was a really warm day which makes it far more enjoyable to race in compared to the wet and windy Britain that we are most used to. Once again I tried my luck fairly early on to join with another rider, but I started on the climb with a lower pace than the chasing bunch which meant that we were soon reeled in. It was a very attacking race which led to small groups of escapee’s pinging off the front of a fast paced race. I wasn’t feeling the best as every lap, the climb took a little bit more out of my legs which in result hurt me even more on the top end of the course in a fairly blustery headwind. I finished around 30th which I was quite disappointed with as I wanted to do a lot better in this race but there was a fairly decent field of riders. Im now feeling generally stronger as a rider as now ill have more digs off the front in attempts to get away as oppose to just sit in, I’d rather be a hitter than a sitter inner! June and July should make for more interesting reading as there is a larger bulk of races including the Brighouse round of the National circuit series… Hopefully this should all go well and ill have a good month report for you all!